CD147 is a broadly distributed integral membrane glycoprotein with two Ig-like domains implicated in a wide range of functions. It is associated at the cell surface with the monocarboxylate transporters MCT1 and 4 but interactions of the extracellular region have not been characterised. We report the characterisation of a form of CD147 with an additional membrane-distal Ig-like domain. In contrast to the two domain form, this three domain form of CD147 interacts homophilically. Surface plasmon resonance analysis using recombinant proteins showed that the interaction was of low affinity (KD ~ 40 μM) and this is typical of many interactions between membrane proteins. cDNA for the 3 domain form are rare but have been identified in human and mouse retina. The finding that the three domain form of CD147 has an extracellular ligand, that is it interacts homophilically, suggests this interaction may be important in aligning lactate transporters in the retina where lactate is an important metabolite. CD147 is a widely expressed membrane glycoprotein (also called OX47, basigin, EMMPRIN and HT7) and has been implicated in matrix metalloproteinase induction, cell adhesion, retinal cell development, HIV attachment, embryonic development, and T cell activation [1–5]. The transmembrane region has a very high degree of cross species homology, being identical between chicken and rat and containing a centrally positioned glutamic acid. This is crucial for its lateral association with monocarboxylate transport molecules MCT1 and MCT4 . MCT1 and MCT4 are proton-coupled transporters of monocarboxylates, principally the metabolic intermediate lactate . It may be that some of the diverse functions attributed to CD147 are due to effects on the carboxylate transporters. The extracellular region of CD147 contains 2 Ig-like domains. This is very common in leukocyte membrane proteins and these proteins often interact with other cell surface proteins . 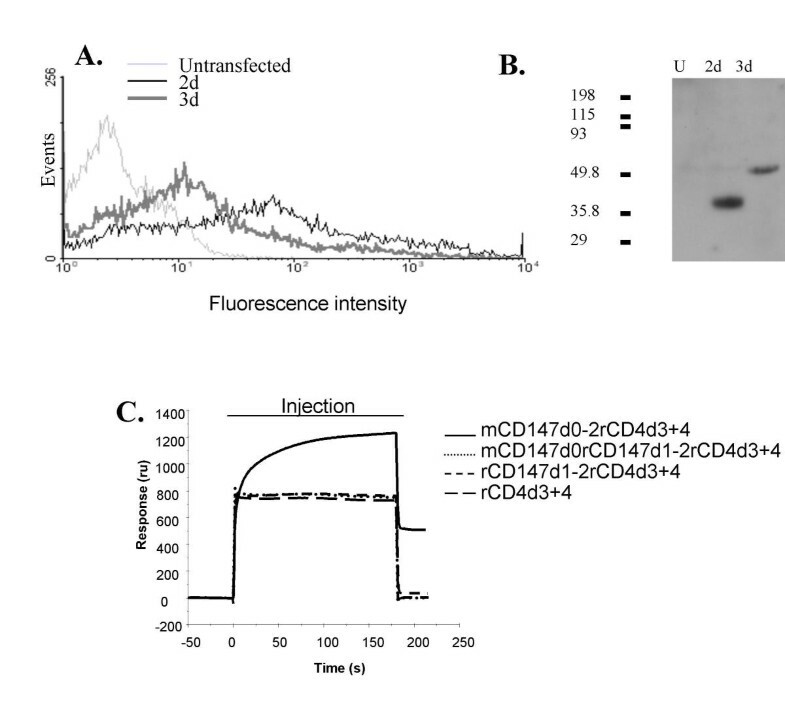 No extracellular ligand has yet been identified for CD147 although an interaction with cyclophilin has been shown to be mediated by glycosaminoglycans . Despite extensive studies using a variety of constructs for recombinant proteins we have not found any cellular ligands (unpublished data) and it may be that the role of CD147 is through cis interactions in the organisation of MCTs at the cell surface. CD147 belongs to a family that contains the synaptic glycoprotein SDR1 (ZOV3, synaptic glycoprotein gp55/65 or np55/65, neuroplastin)  and GP70 (or embigin) [10, 11]. The three proteins are well conserved (37–46% amino acid sequence identity) with no other proteins showing comparable similarity to the group. Like CD147, GP70 associates laterally with MCT1 ; whether SDR1 participates in a similar interaction has yet to be determined. SDR1 is expressed in two isoforms produced by alternative splicing, np55 (a two domain form with widespread expression) and np65 (a three domain form, associated with post synaptic membranes) [13, 14]. Np55 shows considerable sequence similarity with CD147 (Fig. 1) and GP70 but the additional domain of np65 shows little similarity with the either protein. However, there is a region within the first intron of the murine CD147 gene that, if translated, would generate a polypeptide with 3 Ig-like domains and with a high degree of similarity to np65. Very recently this three domain form has been shown to give rise to protein that is expressed in some cells in the retina . As the three domain form np65 has been shown to interact homophilically, this raises the possibility that CD147 exists in a form suitable for homophilic interactions . Amino acid sequence alignment of mouse, human and chicken CD147 and neuroplastin. The sequence of mouse and human domain 0 is in bold. The approximate predicted positions of the beta strands in the Ig-like domains, the transmembrane (TM) and the cytoplasmic regions are indicated. The glutamic acid residue in the transmembrane region is marked with an asterisk. Sequences are from GenBank; CD147 human; AF548371, mouse CD147; AY089967; Chicken X52751 and neuroplastin 65 (Np65); NM_012428. 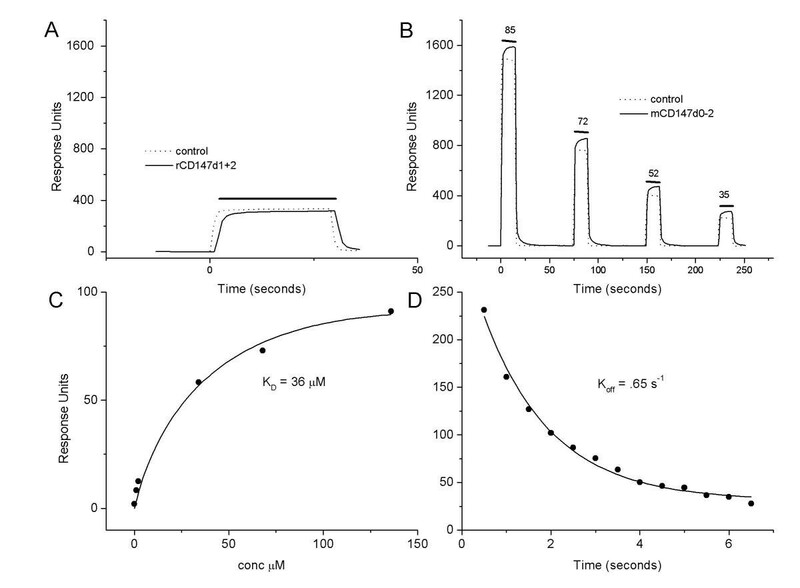 Here we express CD147 recombinant protein containing this third Ig-like domain (d0) and demonstrate that this form interacts homophilically with a KD of approximately 40 μM and an T1/2 of 1 second. This homophilic interaction may affect the subcellular distribution of the CD147-MCT complex, positioning monocarboxylate transporters at sites of cell-cell contact for optimal intercellular transport of lactate. A comparison of the putative extra exon in the mouse CD147 gene against the genomic sequence of human CD147 using pairwise BLAST  revealed a corresponding region. If these regions were to be transcribed, the resulting polypeptide would be 80% identical between human and mouse. A homologous mRNA is also expressed in Xenopus (EST AW158254), with 61% predicted amino-acid identity to the mouse homologue. This demonstrates a significantly higher degree of evolutionary conservation than for the two previously recognised Ig-like domains of CD147 (56% and 46% identity human-mouse). 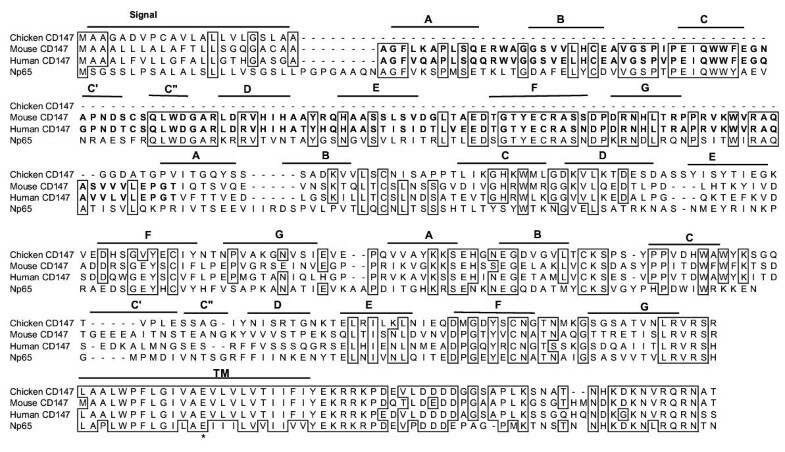 The predicted polypeptide translated from exon 1b is clearly identifiable as an Ig-like domain; it has the two conserved cysteine residues that generally form an intra-domain disulphide bond, and motifs characteristic of a C2-set Ig-like domain (Fig. 1). An unusual feature shared by the predicted domain in mouse and human is an additional cysteine residue in the predicted C' strand region. No other unpaired cysteine residue is found in the extracellular region of CD147. The high level of evolutionary conservation of exon 1b makes it highly likely that this exon gives rise to protein, implying that CD147 exists in two or more alternatively spliced isoforms. In both mouse and human genes, exon 1b has a typical in-frame splice site complying with the 'GT-AG rule'. In common with most exons encoding IgSF domains, the exon boundary is in phase 1, occurring after the first base of a codon (codon 2 of the mature protein). Recently Ochrietor et al. have shown that this three domain form is present in mouse, rat, human, chicken and zebrafish retina pointing to the importance of this isoform. To conform to conventional numbering of IgSF domains in CD147, the additional N-terminal domain encoded by exon 1b will be referred to as domain 0 (d0). With no known source of cDNA containing the CD147 exon 1b, genomic DNA was used as the template. Primers were designed complementary to the 5' and 3' ends of exon 1b (see Methods) to establish PCR conditions. Once a product was obtained, primers for the shorter mCD147d0 product were used on the genomic DNA to obtain third domain sequence (Fig. 1, bold). 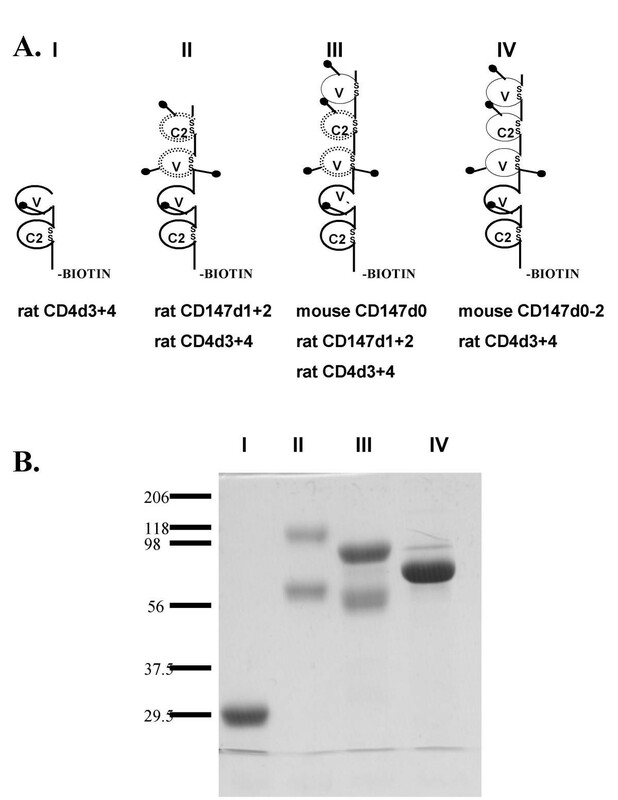 A soluble recombinant protein was generated that had mCD147d0 fused to the extracellular region of rat CD147 (rCD147d1+2), in turn fused to domains 3 and 4 of rat CD4 (rCD4d3+4) with an additional biotinylation sequence at the COOH terminus for biotinylation using the BirA enzyme (mCD147d0rCD147d1+2rCD4d3+4). A schematic representation is shown in Figure 2A (III). In addition, mCD147d0 was fused to mCD147d1+2rCD4d3+4 (Fig. 2A (IV)). Purified proteins are shown in Figure 2B. Two bands were always seen with the proteins containing rCD147d1+2 (Fig. 2B lanes II and III) and may be due to variable glycosylation. Recombinant CD147 proteins. A. Schematic representation of constructs used in the study. Bold lines indicate rat CD4 domains 3+4, thin lines represent mouse CD147 domains, and dotted lines represent rat CD147 domains 1+2. 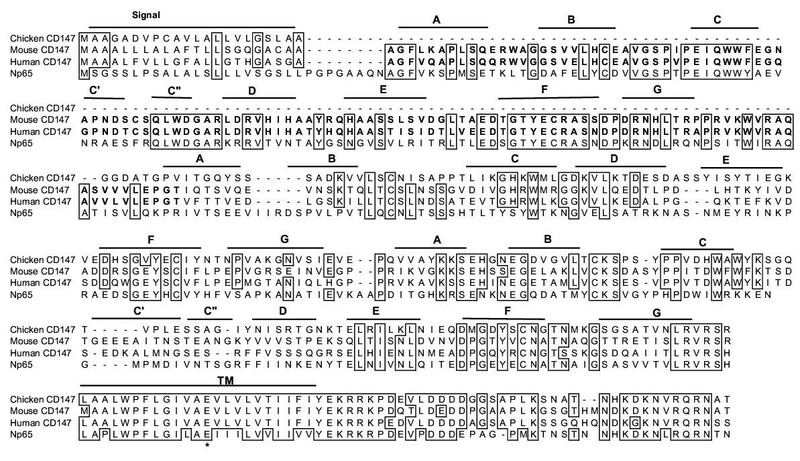 B. SDS PAGE of purified recombinant proteins. Lane I: rCD4d3+4, lane II: rCD147d1+2rCD4d3+4, lane III: mCD147d0rCD147d1+2rCD4d3+4, lane IV: mCD147d0-2rCD4d3+4. Rats were initially immunized with purified soluble recombinant md0-2rCD4d3+4 (Fig. 2A (IV)) and spleen cells were fused to Y3 myeloma cells. Hybridomas were obtained reacting with recombinant protein by ELISA. mAb OX114 was able to detect both the three domain (Fig. 3A, thick grey line) and the two domain forms (Fig. 3A, thin black line) of mCD147 on the surface of transfected HEK293T cells. When these cells were solubilized, subjected to SDS-PAGE and western blotted, as shown in Fig 3B, no band was visualized in the untransfected lane (U), whereas a single band of 38 kDa was seen in the two domain lane, and a single band of 50 kDa was seen in the three domain lane. The specificity of OX114 mAb for domain 1 or 2 was confirmed biochemically. The recombinant proteins shown in Figure 2 were immobilized onto a BIAcore™ chip by capture with OX68, an anti-CD4 mAb and tested for OX114 mAb reactivity. Binding was only found in the flow cell containing mCD147d0-2 (Fig. 3C, the solid line), indicating that it was specific for domains 1 or 2 of mCD147. OX114 mAb gave good staining of mouse thymocytes and to sections of fixed tissue showing the mAb recognized native CD147 (data not shown). It is difficult to raise mAbs recognising mouse CD147 and this seems to be the first published. Several attempts to raise mAb specific for d0 by immunization with combinations of md0-2rCD4d3+4, md0rd1-2rCD4d3+4 and rat cells transfected with CD147 (3d form) were unsuccessful. OX114 mAb binds both two and three domain forms of mouse CD147. A. Flow cytometry of OX114 mAb binding transfected 293T cells. Light grey line represents untransfected cells, black line represents cells expressing mouse CD147d1+2, dark grey line represents cells expressing mouse CD147d0-2. B. Western blot of transfected 293T lysates. Lane U, untransfected cells, 2d, cells transfected with mouse CD147 d1+2, 3d, cells transfected with mouse CD147d0-2. Each lane contains lysate from 106 cells. C. Ability of OX114 mAb to bind to recombinant protein on the Biacore™. Proteins as illustrated in Figure 2 were immobilized on the chip, and OX114 mAb was passed over as indicated. OX114 mAb only binds to constructs containing mouse CD147d1+2. As the three domain form of neuroplastin np65 but not the two domain form, had been shown to interact homophilically  we tested to see if the three domain form of CD147 interacted homophilically by surface plasmon resonance using a BIAcore. Recombinant biotinylated mCD147d0-2rCD4d3+4 was immobilized on the sensor surface via streptavidin. This bound mAb OX114 strongly and assuming bivalent binding of the antibody, indicated that at least 80% of the immobilized mCD147d0-2rCD4d3+4 was antigenically active and likely to be correctly folded (data not shown). To ensure the unbiotinylated mCD147d0-2rCD4d3+4 was monomeric prior to affinity measurements, the affinity purified protein was subjected to gel filtration immediately prior to affinity analysis to prevent aggregation (time elapsed between gel filtration and affinity measurement was no more than 2 h). Changes in response were observed when 105 μM mCD147d0-2rCD4d3+4 was passed over immobilized mCD147d0-2rCD4d3+4, but not over a control protein, hCD5d1-3rCD4d3+4 at 25°C (data not shown). This binding was detectable down to concentrations of 2 μM. To ensure this interaction was mediated by the third domain, rCD147d1+2rCD4d3+4 was tested for its ability to self associate in a similar manner at 25°C. There was no detectable binding when 45 μM rCD147d1+2rCD4d3+4 was passed over directly immobilized rCD147d1+2rCD4d3+4 (Fig 4A). The immobilized protein was shown to be active by antibody binding (OX47 and PE-2, data not shown). The three domain form of CD147 interacts homophilically. A. BIAcore trace showing soluble rCD147d1-2rCDd3+4 at 45 μM passed over control biotinylated rCD147d1-2rCDd3+4 (1854 RU) and rCD4d1-4 (5946 RU) at 25 °C. The period of injection is indicated by the bar above the trace. There is no difference between the two flow cells showing no specific binding and the signal is due to the high concentration of protein passing over the chip. B. BIAcore trace showing four different concentrations (μM) of soluble mCD147d0-2rCDd3+4 passed over (and indicated by the bars over the trace) control biotinylated hCD5d1-3rCD4d3+4 (2033 RU) and biotinylated mCD147d0-2rCDd3+4 (1069 RU) at 37°C. C. The specific binding data in (B) i.e. after subtraction of signal over control flow cell were analysed using a non-linear curve fit graph to equation 7  assuming KD1 = KD2. D. Non-linear curve fit to off rate data for soluble mCD147d0-2rCD4d3+4 dissociating at 37°C from mCD147d0-2rCD4d3+4 immobilized at 1455 RU. The affinity of the homophilic mCD147d0-2rCD4d3+4 interaction was calculated at 37°C by injecting a series of different concentrations of purified soluble mCD147d0-2rCD4d3+4 over immobilized mCD147d0-2rCD4d3+4 and a negative control of hCD5d1-3rCD4d3+4 (Fig. 4B). The binding is represented by the increase in response units (RU) observed relative to that in the control flow cell (Fig. 4B) once equilibrium has been reached and is plotted as a binding curve (Fig. 4C). The weak binding is typical of that of many cell surface protein interactions. The KD cannot simply be calculated from these data because the situation is complicated by the ability of the material to interact homophilically in solution and on the chip in addition to the binding from solution to chip. Previous analysis on the CD150 homophilic interaction had established methods to do this taking the fluid phase and immobilized interactions into account . Assuming all interactions were of the same affinity, the data gave a best fit for an affinity of KD = 36 μM (Fig. 4C). The resultant concentration of immobilized CD147 Af is slightly higher than that calculated (121 μM) using equation 14  and an experimentally determined value for P of 5.8. This may be due to uneven coating of the chip with CD147 and the discrepancy is reduced at higher levels of immobilized CD147. At a calculated concentration of immobilized CD147 of 138 μM, two affinity determinations gave KD = 39 μM and KD = 35 μM with Af = 150 and 151 μM respectively. Kinetic analysis of the interaction at 37°C yielded a Koff = 0.7 s-1 (Fig. 4D) for all levels of immobilization of mCD147d0-2, indicating that kinetic measurements were not affected by rebinding. Kon values were calculated by fitting the association binding phase to a simple 1:1 binding model using a Koff of 0.7 s-1 and were about 7 × 104 M-1 s-1 (Fig. 4). The t1/2 is 1 s.
Here we report the characterisation of an isoform of mCD147 containing a membrane distal third Ig-like domain. Unlike the two domain form, the three domain form can interact homophilically with a relatively low affinity of KD = 40 μM. This affinity is typical of many protein interactions between cell surface proteins that are often in the range 1–100 μM . Several other proteins with IgSF domains have been shown to interact homophilically including SLAM (CD150), NCAM, PECAM (CD31) and the coxsackievirus and adenovirus receptor (CAR). Using the same methods as here the affinity of the 2 IgSF domain protein CD150 had a KD of around 200 μM  indicating a somewhat weaker interaction than CD147. CD150 is involved in control of T cell activation and has activation motifs in its cytoplasmic region. Data for other interactions are less easy to compare as different methods and temperatures have been used. For example the KD for homophilic interactions of proteins with IgSF domains are NCAM, 100 μM [19, 20], CAR 16 μM , CD31 12.5 μM . The desmosomal cadherins have a higher affinity with a KD of 4.2 μM . NCAM is involved in neuronal development; CAR is best defined as a virus receptor but also for homophilic interactions where interestingly it has been implicated in the control of small molecules across tight junctions . CD31 is involved in interactions between endothelial cells, has inhibitory motifs in the cytoplasmic regions but has additional ligands . We have been unable to determine the distribution of the three-domain form of CD147 due to difficulty in raising specific high affinity mAb for d0. We were successful in producing the first mAb against mouse CD147 that was effective in staining cells in suspension and in tissue sections. Previously polyclonal antiserum has been used to identify mouse CD147. The three domain form is clearly rare as CD147 has been biochemically characterised in detail from many tissues but only in retina has a high-molecular weight form been detected . Recently cDNAs for the three domain form have been identified. Of 13 known ESTs encoding human CD147 d0, 9 were derived from retina, indicating a tightly restricted expression. During preparation of this paper, Ochrietor et al. showed the three-domain form of CD147 was expressed in tissue lysate from retina, but not from other tissues including brain, lung, liver and spleen and specifically labelled the photoreceptor cells . We have previously shown that the two Ig-domain form of CD147 associates laterally with the monocarboxylate transport proteins MCT1 and MCT4 and is vital for the transport of the transporters to the cell surface . This requirement for co-expression is manifested in vivo by the greatly diminished expression of MCT1, 3 and 4 in the retina of CD147-null mice , which provides a likely explanation for the retinal degeneration observed in these mice . Immunoprecipitation studies have shown that CD147 can form oligomers [28, 29]. These cis interactions between CD147 depended on the NH2 terminal domain of CD147 . Fluorescence resonance energy transfer experiments have confirmed the close association between CD147 and MCT1 and shown the minimum complex formation contains two CD147 proteins and two MCT1s . We were unable to detect any direct binding using the two domain CD147 form and indeed using highly avid multivalent recombinant forms of mCD147d1+2, we have been unable to demonstrate cell surface ligands (unpublished data). It is possible that the cis interactions involving the NH2 terminal domain of CD147 observed by Yoshida et al. require close proximity at the cell surface as they were not detectable in trans. Our assays are more comparable to the trans situation and may not detect very weak cis interactions. Homophilic interactions of cell-surface proteins typically result in their accumulation at sites of cell-cell contact. A likely consequence of the homophilic interaction of three-domain CD147 is therefore to cause accumulation of CD147, and consequently of MCTs, at sites of cell-cell contact. There is a comparable interaction with the sodium channel. In this case, the alpha chain that mediates transport is associated with a single pass beta chain that contains a single Ig-like domain that can interact homophilically and bring ankyrin associated with the cytoplasmic region to the point of cell-cell contact . This organisation of MCTs at closely positioned opposing cell membranes would create an efficient interface for intercellular transport of monocarboxylates and there is evidence of close proximity of transporters on opposing membranes in retina . Such an effect would be uniquely desirable in the retina, as Muller cells and photoreceptors are metabolically coupled, with the highly glycolytic Muller cells producing an excess of lactate, which is taken up by photoreceptors and used as a substrate for oxidative metabolism [33, 34]. (Both Muller and photoreceptor cells express the three domain form with higher levels in the photoreceptors) . In tissues where the homophilic interaction is not required, the two domain form of CD147 is sufficient to facilitate surface expression of MCT. Whether two domain CD147 has additional activities is unclear. We have identified the first ligand for the extracellular region of CD147 in finding that the rare three domain form interacts homophilically. As cDNA for this form is largely restricted to retina, it suggests that CD147 (three domain form) is important in aligning MCT in the retinal and hence directing lactate transport. Soluble recombinant CD147 proteins were expressed using the pEE14 vector  in Chinese hamster ovary (CHO)-K1 cells. The CD147 extracellular regions (mouse CD147 domains 0 to 2; mCD147d0-2, mouse CD147 domains 1 and 2; mCD147d1+2, mouse CD147 domain 0 on rat CD147 domains 1 and 2; mCD147d0rCD147d1+2) were cloned into a pEFBOS vector between the rat CD4 leader sequence and rat CD4 domains 3+4 (rCD4d3+4) followed by a biotinylation sequence tag . A schematic representation of the resultant recombinant proteins is shown in Figure 2. Transfection was carried out using Fugene (Roche Molecular Biochemicals, Welwyn Garden City, UK) as per manufacturer's instructions. Constructs for cell surface CD147 were expressed in pEFBOS in human embryonic kidney (HEK) 293-T cells . The full length mouse CD147d0-2 with transmembrane and cytoplasmic tail (mCD147d0-cyt) was expressed with the rat CD4 leader and mouse CD147 d1-cytoplasmic tail (mCD147d1-cyt) was with the mouse CD147 leader. Transfection was carried out using Fugene as described above, and cells were harvested 3 days after transfection. The recombinant proteins were purified from spent tissue culture supernatant with an anti rat CD4 (OX68 mAb) affinity column [38, 39]. Concentration was calculated using a calculated molar extinction coefficient of 80880 cm-1 M-1. Purified protein was dialyzed into 10 mM Tris-HCl, pH 8, and concentrated to 0.5–0.8 ml using a 10,000 MW cut off Centricon (Amicon, Inc., Beverly, MA) and incubated with 1 μl BirA enzyme (Avidity, Denver, CO). Biotinylation was complete after 2–4 hours at 30°C or overnight at room temperature as assessed by binding of chimeras to streptavidin immobilized via OX68 (a CD4d3+4 mAb) on the BIAcore™. mAb were produced by standard methods using the Y3 rat myeloma fusion partner. The immunisation schedule that was successful for OX114 consisted of three injections of 20 μg recombinant mCD147d0-2rCD4d3+4. mAb were screened by ELISA on recombinant proteins and cells. Antibody isotype was determined using Rat Ig Isotyping Kit (Pharmingen). Combinations of these proteins and mCD147d0rCD147d102rCD4d3+4 were used in unsuccessful attempts to obtain a CD147d0 specific mAb. Affinity analysis was performed on a BIAcore 2000™ (BIAcore AB, St. Albans, UK). Streptavidin (0.2 mg/ml in 10 mM sodium acetate, pH 5, Pierce Chemical Co. Rockford, IL) was coupled to a research grade CM5 BIAcore™ chip using an amine coupling kit supplied by the manufacturer. After an activation time of 5 min, between 2000–3000 response units (RU) of streptavidin were immobilized. The surface of the chip was washed with 0.1 M glycine-HCl, pH 2.5 after coupling. Recombinant biotinylated mCD147d0-2rCD4d3+4 at a concentration of 40 μg/ml, or biotinylated hCD5d1-3rCD4d3+4 (control) from tissue culture supernatant were injected over immobilized streptavidin. The running buffer was HBS buffer (10 mM HEPES pH 7.4, 150 mM NaCl, 3.4 mM EDTA, and 0.005% surfactant P20). Equilibrium affinity measurements were carried out at 37°C as . Briefly, increasing and decreasing concentrations of mCD147d0-2rCD4d3+4 (5 μl injections at 20 μl/min) were passed over mCD147d0-2rCD4d3+4 and human CD5 domains 1 to 3 (hCD5d1-3rCD4d3+4). Origin software, version 5.0 (Medical Software, Inc., Northampton, MA) was used in the analysis taking into account possible association in liquid phase and on the chip as discussed in . PK noted the extra exon, made constructs and the initial observation. SMH carried out the biochemical analysis of the interaction and characterisation of the mAb. OJH did preliminary biochemical analysis. MP made the mAb. MHB supervised and developed the methods and vectors. ANB oversaw the project and writing the manuscript. S Melanie Hanna, Peter Kirk contributed equally to this work. This work was supported by the Medical Research Council. We are grateful to Colin Barnstaple for the PE-2 mAb and Mike Tomlinson for cell binding experiments with rCD147rCD4d3+4. Mark Chapman assisted with production of mCD147rCD4d3+4.